The Identity Management (IdM) domain consists of a group of machines that share the same configuration, policies, and identity stores. The shared properties allow the machines within the domain to be aware of each other and operate together. IdM servers are also IdM clients enrolled with themselves: server machines provide the same functionality as clients. IdM supports Red Hat Enterprise Linux machines as the IdM servers and clients. 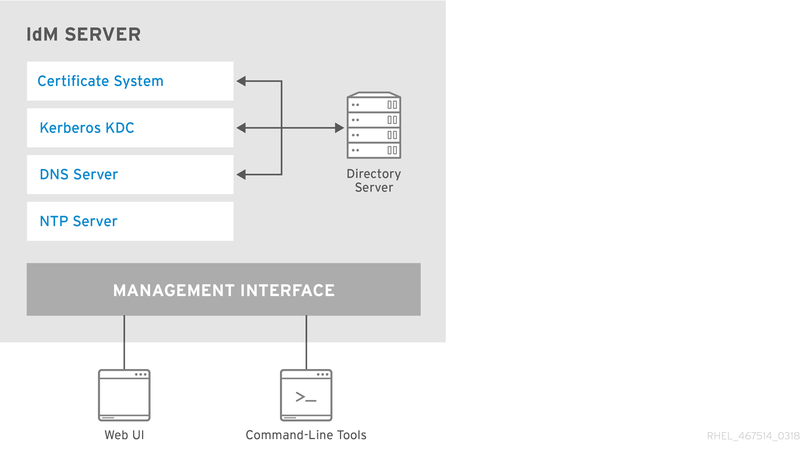 This guide describes using IdM in Linux environments. For more information on integration with Active Directory, see the Windows Integration Guide. The IdM servers act as central repositories for identity and policy information. They also host the services used by domain members. IdM provides a set of management tools to manage all the IdM-associated services centrally: the IdM web UI and command-line utilities. For information on installing IdM servers, see Chapter 2, Installing and Uninstalling an Identity Management Server. To support redundancy and load balancing, the data and configuration can be replicated from one IdM server to another: a replica of the initial server. You can configure servers and their replicas to provide different services to clients. For more details on IdM replicas, see Chapter 4, Installing and Uninstalling Identity Management Replicas. Most of the following services are not strictly required to be installed on the IdM server. For example, services such as a certificate authority (CA), a DNS server, or a Network Time Protocol (NTP) server can be installed on an external server outside the IdM domain. IdM uses the Kerberos protocol to support single sign-on. With Kerberos, the user only needs to present the correct user name and password once. Then the user can access IdM services without the system prompting for the credentials again. For details on how Kerberos works, see the System-Level Authentication Guide. For information on how to authenticate using Kerberos in IdM, see Section 5.2, “Logging into IdM Using Kerberos”. For information on managing Kerberos in IdM, see Chapter 29, Managing the Kerberos Domain. IdM includes an internal LDAP directory server instance where it stores all the IdM information, such as information related to Kerberos, user accounts, host entries, services, policies, DNS, and others. The LDAP directory server instance is based on the same technology as Red Hat Directory Server. However, it is tuned to IdM-specific tasks. This guide refers to this component as Directory Server. In most deployments, an integrated certificate authority (CA) is installed with the IdM server. You can also install the server without the integrated CA if you create and provide all required certificates independently. For more details on installing an IdM server with the different CA configurations, see Section 2.3.2, “Determining What CA Configuration to Use”. This guide refers to this component as Certificate System when addressing the implementation and as certificate authority when addressing the services provided by the implementation. For information relating to Red Hat Certificate System, a standalone Red Hat product, see Product Documentation for Red Hat Certificate System. IdM uses DNS for dynamic service discovery. The IdM client installation utility can use information from DNS to automatically configure the client machine. After the client is enrolled in the IdM domain, it uses DNS to locate IdM servers and services within the domain. For more information about service discovery, see the System-Level Authentication Guide. For information on using DNS with IdM and important prerequisites, see Section 2.1.5, “Host Name and DNS Configuration”. For details on installing an IdM server with or without integrated DNS, see Section 2.3.1, “Determining Whether to Use Integrated DNS”. Many services require that servers and clients have the same system time, within a certain variance. For example, Kerberos tickets use time stamps to determine their validity and to prevent replay attacks. If the times between the server and client skew outside the allowed range, the Kerberos tickets are invalidated. By default, IdM uses the Network Time Protocol (NTP) to synchronize clocks over a network. With NTP, a central server acts as an authoritative clock and the clients synchronize their times to match the server clock. The IdM server is configured as the NTP server for the IdM domain during the server installation process. Running an NTP server on an IdM server installed on a virtual machine can lead to inaccurate time synchronization in some environments. To avoid potential problems, do not run NTP on IdM servers installed on virtual machines. For more information on the reliability of an NTP server on a virtual machine, see this Knowledgebase solution. IdM clients are machines configured to operate within the IdM domain. They interact with the IdM servers to access domain resources. For example, they belong to the Kerberos domains configured on the servers, receive certificates and tickets issued by the servers, and use other centralized services for authentication and authorization. An IdM client does not require dedicated client software to interact as a part of the domain. It only requires proper system configuration of certain services and libraries, such as Kerberos or DNS. This configuration directs the client machine to use IdM services. For information on installing IdM clients, see Chapter 3, Installing and Uninstalling Identity Management Clients. 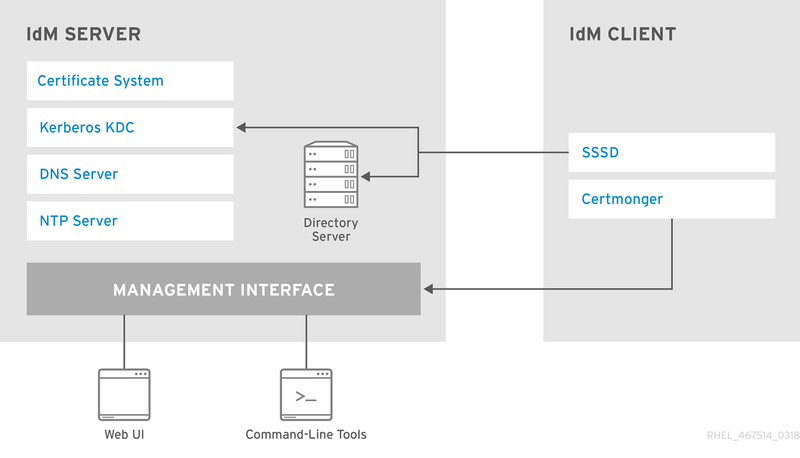 With SSSD, the IdM administrators can define all identity configuration centrally in the IdM server. Caching enables the local system to continue normal authentication operations if the IdM server becomes unavailable or if the client becomes offline. For more information about SSSD, see the System-Level Authentication Guide. SSSD also supports Windows Active Directory (AD). For more information about using SSSD with AD, see the Windows Integration Guide. The certmonger service monitors and renews the certificates on the client. It can request new certificates for the services on the system. For more information about certmonger, see the System-Level Authentication Guide.